Another piece from the ace student reporters from Murch Elementary. 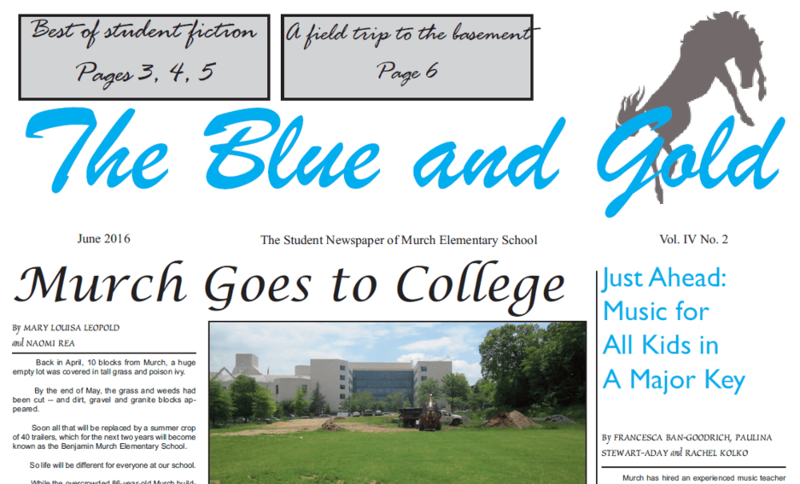 To see the original articles and read more stories – including book reviews and fiction – please see the June edition of their student newspaper, The Blue and Gold. We have permission to reproduce it here. What are Murch kids doing in their free time? You might think that most of them would be playing outdoors or watching TV or concentrating on Play Station, Minecraft or other video games. But guess what? The Crouch sisters – 4th-grader Katie and 2nd-grader Haley – often help the Humane Society to find homes for needy dogs. They go to the animal shelter and sign up to bring a dog to their house. Then they ask people whether they’d like to take the dog home with them. “So far we have found about six or seven dogs a home,” Katie said recently. The Crouch family accepts many types of dogs, but usually it gets pit bulls to take home. (Pit bulls were created for strength and agility by breeding bulldogs with terriers). In fact, Katie said, her family once kept a dog in their foster care for about a month. When the sisters must part with a dog that has lived with them for a while, they’re not unhappy about it. “I’m not sad because I know that it will be a lot better, not just for me, but for the dog,” Haley said. And the sisters do have a dog of their own. It came from the Humane Society shelter, too. Do you do something good for animals or humans in your spare time? If you do, please tell someone on The Blue and Gold staff about it.